Put your hands over the piano keys. Press at least 3 or 4 down at once. The images in these editions of prints are of a process Julian Schnabel has developed and expanded on for years. They are records of his actions each made whole by degrees of dissonance and harmony - notes in a chord. Water falls not down but according to the play of light and the light and dark parts within us where we harbor hopes of immersion and a release back into the glinting sun. Superimposition creates simultaneity: everything happening at once. The water before, the water now, the water after. The tree that came over the falls, branches nearly shorn. What happened? What else happened? What happened in me? Another tree pole-axed by the drop on the rocks flew back up in front of the one still falling. A cart and the refuse in it came over the edge and plummeted, a torn sheet billowing out and floating down. But you couldn’t really see it all for the leaves in your face. Selections from a satchel of memories and fantasies superimpose themselves upon the sights and sounds of the present. Eyes shut or open we are expert in selecting where our focus falls. Where our eye falls may not be where our heart falls for our being has many paths. We see simultaneously, chronologically, narratively, mystically. Take apart a drawing. An impulse broken only by the most complete drawings. But a similar act: creating a narrative from a set of abstract shapes is an invitation to a secret picture of our own. In this form, in the scale of the page, Julian has worked out feelings - intimate and concise. Like the page, like poems or letters do, these prints offer vibrant reflection. An adult learns that the unconscious is filled and fixed by images and experiences of childhood. What a child experiences is the printing of their unconscious with images and events. 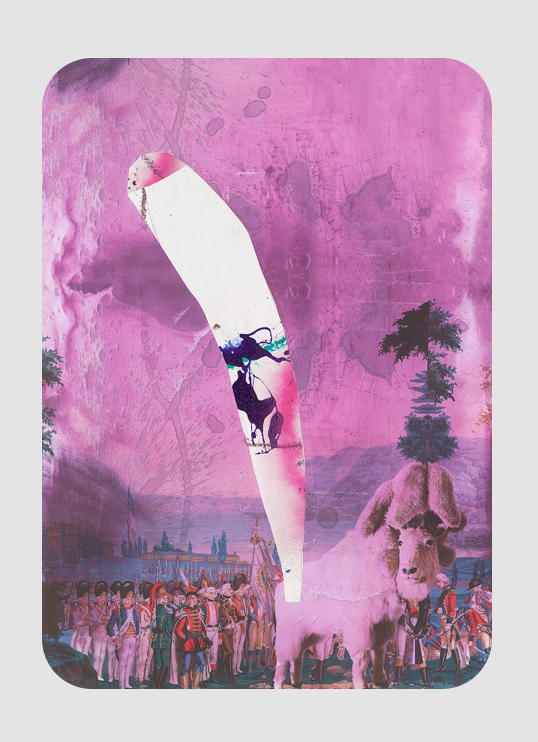 Julian Schnabel’s prints are a palimpsest - things that occurred before he arrived; as if he became one of the children who was looking out the school bus window with children he never met: Rorschach trees and clouds, purple explosions of excitement and doubt, and filtered light peering from behind a cloud. We’re learning what life is, images become physical facts as we learn to grasp the concepts of death and time, who and where we are. We even see places we might have heard of but will never go to. The images create an unlimited, incomprehensible world and the wonder and fear a child feels trying to grasp it: a goat with a teddy bear crown; an army of uniformed men in a purple storm and most terrifying the distance our goat mother/father appears to be from us, the viewers. Incongruous, unnameable marks, discarded visual aids no longer in use fill our sleep. We wake from the dream, confused, thrilled, and frightened by the huge world within our heads and the new day.